Sometimes things really do come full circle in sports, and Auburn’s thrashing of Tennessee in Sunday’s SEC Tournament championship game is evidence of that. 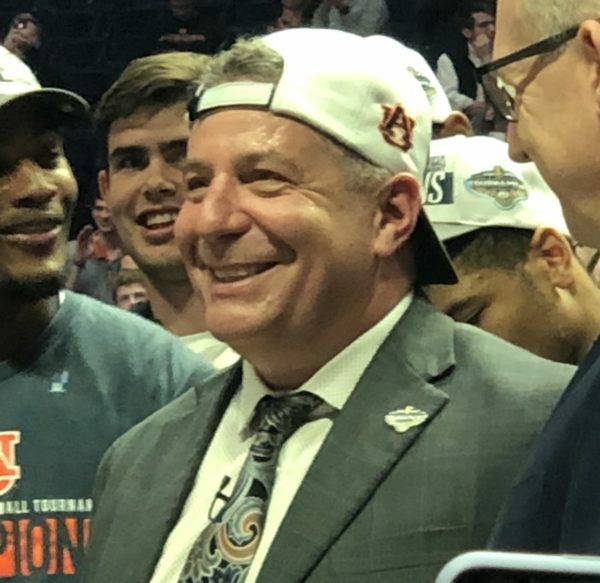 In Bruce Pearl’s fifth season at Auburn, he has brought the Tigers program — the absolute dregs of the SEC when he took over five years ago — all the way back. Today’s win gave Auburn its first SEC Tournament title since 1985, and only its second in history. And in getting the program to this point, he has also completed the rehabilitation of a career that appeared dead on more than one occasion. There is certainly poetic justice in that he reached the pinnacle of his accomplishment at the Loveliest Village on the Plains against the school that was forced to fire him eight years ago. In winning the SEC Tournament, Pearl was able to accomplish something he never did at Tennessee. Although he guided the Volunteers to the NCAA Tournament in each of his six seasons in Knoxville — including the university’s only Elite Eight appearance in 2010 — he was never able to secure the SEC Tournament trophy, losing his only chance in 2009 when the Volunteers lost to Mississippi State. But now, Pearl can bask in the glow of an unexpected four-games-in-four-days title that came from the middle of the pack. And whatever happens in the NCAA Tournament – the consensus is that 26-9 Auburn will be a #4 seed – nothing will take this accomplishment away. “The championship means so much because it might have been the best the SEC has been in so many years. We feel very blessed to be where we are,” Pearl said after the game. Pearl resurrected a moribund Tennessee program when he arrived in Knoxville in 2005. The transformation of Thompson-Boling Arena into one of the nation’s nicest arenas is largely a result of his doing, and the six consecutive NCAA appearances remains the longest streak in school history. But the challenge he faced at Auburn was an entirely different animal. In the Tigers’ four seasons under Tony Barbee prior to Pearl’s arrival, they won just 49 games. Worse, he inherited a fan base that was beyond apathetic — even for SEC standards. And after losing 20 games in each of Pearl’s first two seasons, it was clear that this turnaround was not like what he encountered at Tennessee. But three years later, he has a program for which “also ran” status would have been a generous descriptor at the top of the SEC mountain. Only a year and a half ago, an FBI investigation swirled around his program – and just this week, former assistant Chuck Person pleaded guilty to conspiracy charges related to the scandal – and it was not clear whether Pearl would survive. He weathered that storm last season and led his club to a share of the SEC regular season championship, but a first-round SEC Tournament loss and a blowout at the hands of Clemson in the NCAA Tournament put a damper on that accomplishment. Now, after doing something that has not been done at the school in 34 years, he has proved that he has more than survived. This entry was posted on Sunday, March 17th, 2019 at 3:17 pm by David Changas	and is filed under feature, microsites, sec. Tagged: auburn tigers, bruce pearl, sec tournament. You can follow any responses to this entry through the RSS 2.0 feed. You can leave a response, or trackback from your own site.